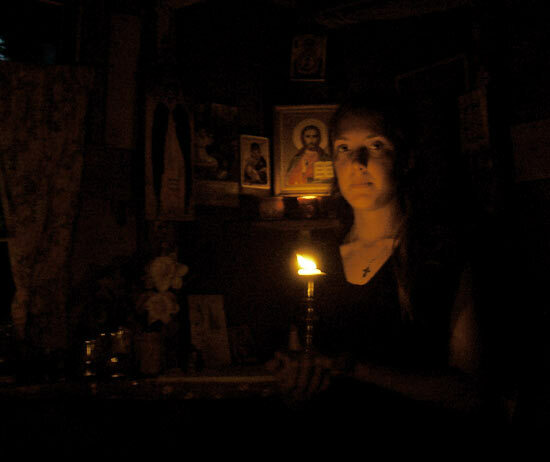 in the Russian Orthodox Church. I have put together some of the holy texts from the Christian tradition and drawn spiritual pictures to some of the prayers of the church, and written texts about how I understand the message of Christ from the New Testament as it was practised by the desert fathers and by hesychasts* in Asia Minor, most of the countries included in the Balkan region, Egypt, Russia, Athos in Greece, and today even in the rest of the world. Lord Jesus said: "You, then, are to be perfect as your heavenly Father is perfect." 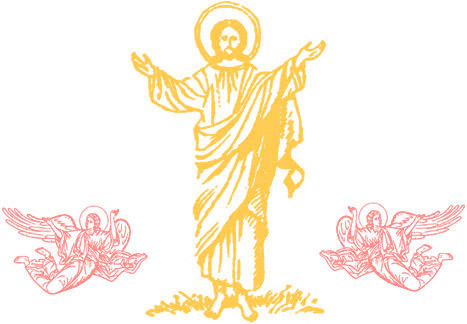 St Matthew 5:48 This perfection is resting and accessible in each one of us individual christians, and is possible to experience, to identify oneself with and to realize; our true being - CHRIST within man. * Hesychasm - (from the Greek word hesykia - conscious resting in God) Christian orthodox asceticism using the inner, incessant Jesus prayer, "the prayer of the heart", together with particular breathing exercises, to overcome one's lower, self-centred nature and regain identity with God. according to the Julian church calendar on the 7th of January, 13 days later. O Lord, glory to Thee"
confirmed the certainty of the word. keeping His statutes and laws. through thy supplications we receive remission of sins." Ingegerd Olofsdotter was born around year 1001; she was daughter to Olof Skötkonung, the first christened Swedish king, who was baptized year 1008. She was married to Grand Duke Jaroslav of Novgorod/Kiev, with whom she gave birth to 10 children. 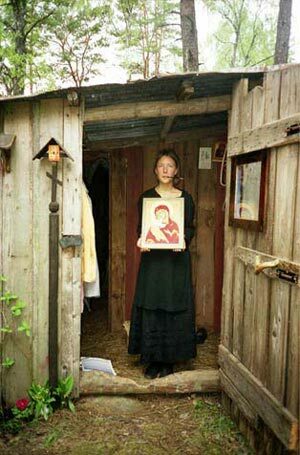 She was canonized by the Russian Orthodox Church and given then name St. Anna of Novgorod. 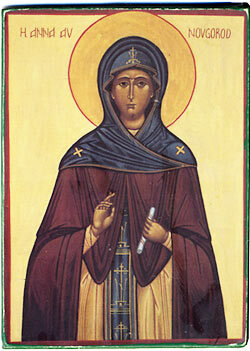 St. Anna died year 1050 as Grand Duchess of Kiev. Her day of celebration is the 23rd of February. 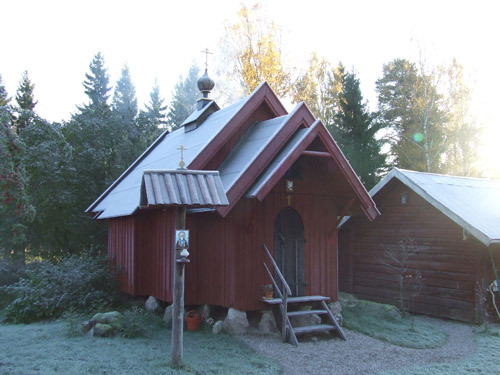 There is a small town in Sweden, Eskilstuna, where there is a Swedish Orthodox church called after St. Anna where she is revered as the Swedish national saint. 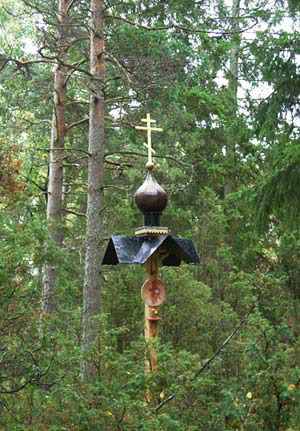 "Every spring the Russians are witnesses to the resurrection of nature. 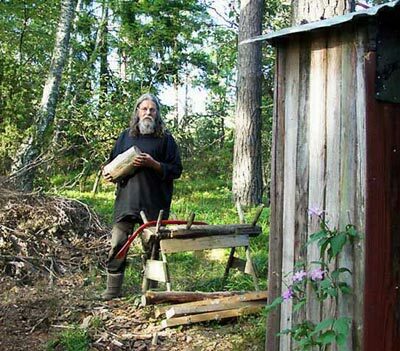 After half a year of lifeless stillness the life is returning to the Russian country. With victory fanfares the rivers and lakes are breaking the ice, which has kept them captivated for several long months. Grass and flowers can during only one night spring forth on the ground, which has for 1ong been covered with a thick, white mantle; the birds begin to sing, the air is seasoned with scents, and humans and animals are feeling enlivened and as if born again. Life has once again proved to be stronger than death. … Through centuries have in Russia not only a few pious humans, but the nation as a whole prised and thanked God for the Resurrection of Christ. The Easter night’s service is an experience, which has no parallel in the religious life of other countries." "Lent begins in the East on a Sunday night, which is called the Sunday of Forgiveness. After Evensong the priest solemnly asks his parishioners to pardon all his shortcomings and offences, and they in return ask him to forgive them. 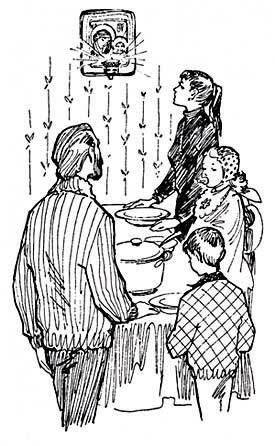 Then the members of the congregation address a similar request to each other, and the same thing is done afterwards at home. Thus, reconciled with everybody, Christians of the East enter upon the period of fasting and mortification. Lent makes a profound impression upon the life of all Church members; their food is altered, their Church services, music, and vestments are radically changed. The rules of fasting are severe: meat, fish, milk and eggs are forbidden for seven weeks: the services are long and mournful, and include many prostrations. It is a time of purification, and reparation for evils committed in the past. 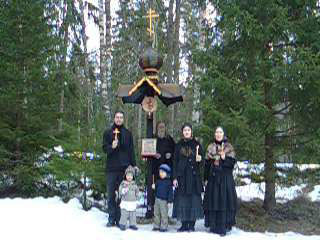 Eastern Christians choose usually one of the weeks of Lent for what is called in Russian Govenie. There is no corresponding word in English; Govenie means a period of self-examination, prayer and fasting, which ends with confession and communion. A person who starts Govenie I expected to spend his time as in retreat, though he usually remains at home. He attends all the daily services; he fasts rigorously, reads books of spiritual edification, gives alms, and seeks reconciliation with those with whom he has quarrelled. Govenie usually lasts for a week and it involves real bodily privation. The Lenten services take at least five hours a day, and regular attendance means standing or prostrating oneself for the whole of that period. If Holy Week is chosen for Govenie, this involves even longer hours spent in church. The severity of bodily mortification is, however, mitigated by the supreme beauty of the Lenten services, by their unique dramatic quality, and by their musical appeal. Some of the highest achievements of religious poetry and music are found in the hymns of Holy Week, and many of the more lax Christians who only seldom go to church, choose this time, since it is difficult to remain unmoved by the power and beauty of the Lenten worship." 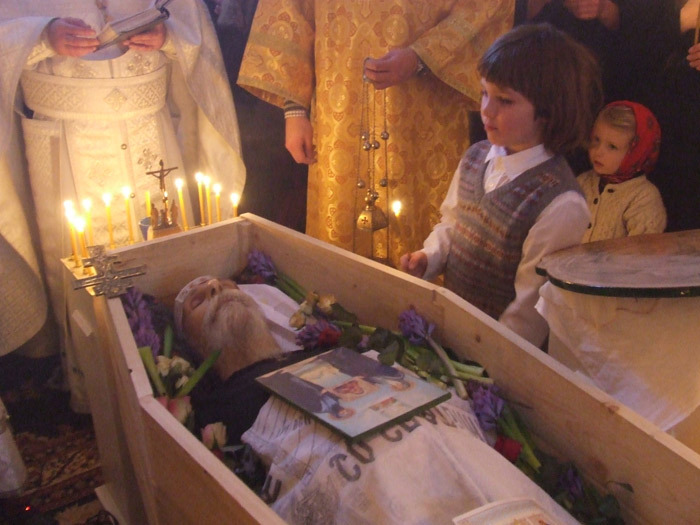 He hath destroyed death by death"
"Lent ends abruptly on Easter Eve, the greatest feast of the Eastern Orthodox Church. The midnight service has often been described, for it has no parallel in the experience of other Churches. Matins begins by a procession, which leaves the church, goes round the building and returns singing the triumphant hymn “Christ is risen from the dead, trampling down death by death, and upon those in the tomb bestowing life.” Each worshipper procures beforehand a candle, and as soon as the procession starts the first candle is lit, its bearer then lighting that of his neighbour, and so on until the whole church is a blaze of light and warmth. There is no reading, and everything is sung to what seem almost like dance tunes, and the whole service is full of movements, life and joy. At its close the priest greets each parishioner with the threefold Eastern kiss, and the same greeting is exchanged between the members of the congregation. 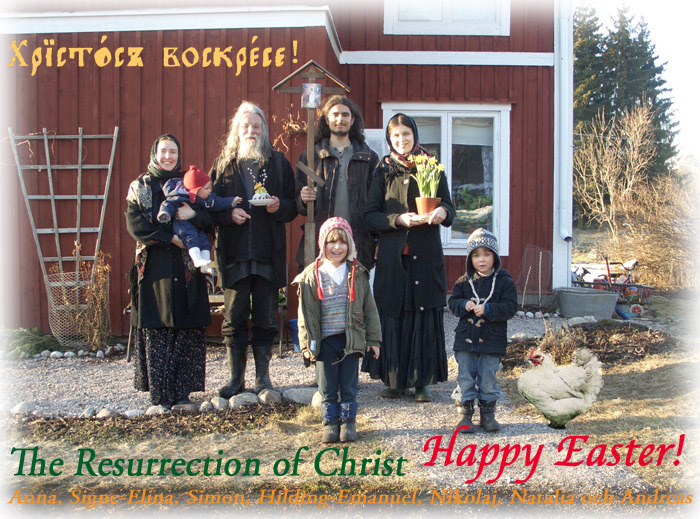 On their return home the Russian Christians have their Easter meal, with its special dishes served only for that feast. Easter Sunday is unlike any other day in the year. 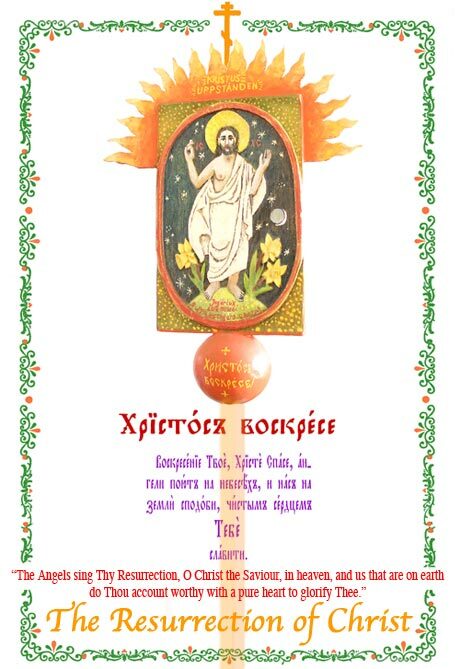 There is no service in the morning, all ordinary customs and habits are brushed aside, and instead of usual greetings, everyone is welcomed with the words “Christ is risen”, and the Easter kiss is exchanged with everybody that one meets. 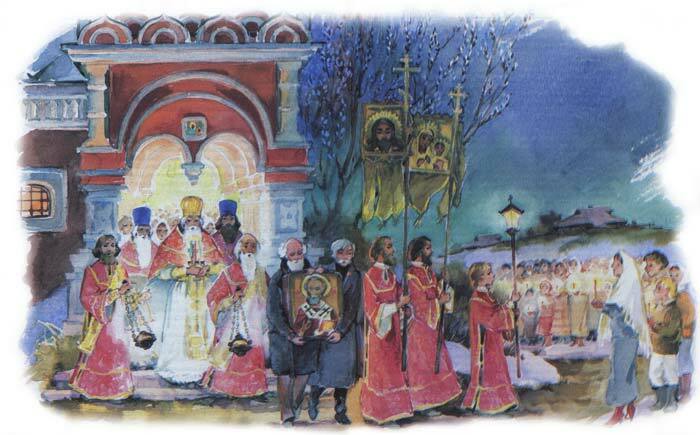 Because of the glory bestowed upon human nature by our Lord’s victory over death, Russian Christians do not kneel in church during the period between Easter and Pentecost. Easter is the culminating point of the whole Church’s year; all other Sundays are mere stepping-stones leading up to that unique day, and they are all therefore dedicated to the commemoration of the Resurrection. 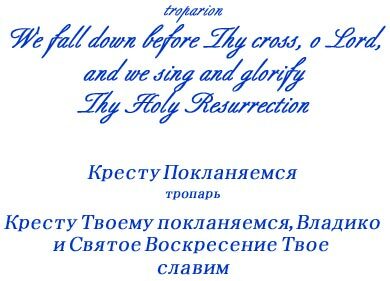 In fact, the Russian word for Sunday is “Resurrection”." Text from "The Church of the Eastern Christians" by Nicolas Zernov. 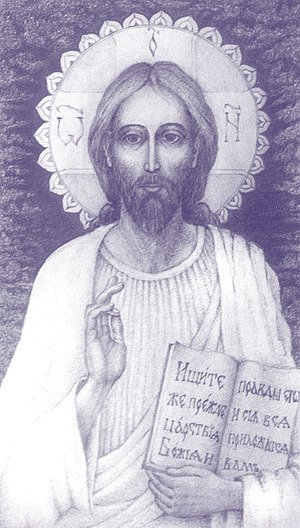 Picture from the book "Kniga o tserkvi" (The book about church), published by Palomnik Moscow -98. 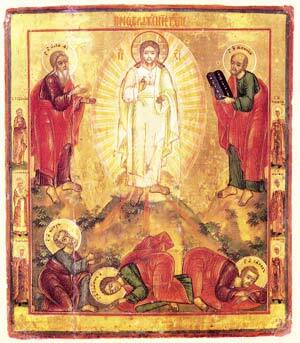 “The fest of feasts and the triumph and triumphs – the Holy Easter. 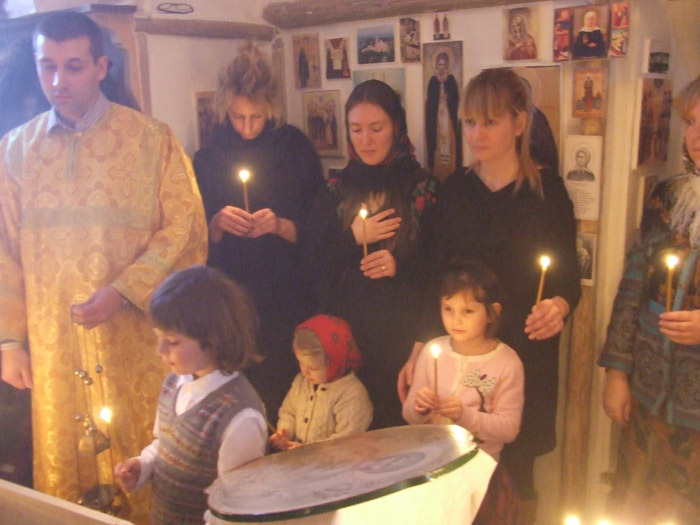 The Orthodox churches are filled with worshippers. All are received by the Risen Christ and the Holy Church gives everyone a chance to partake of the great feast of faith. ‘O death, where is thy sting? 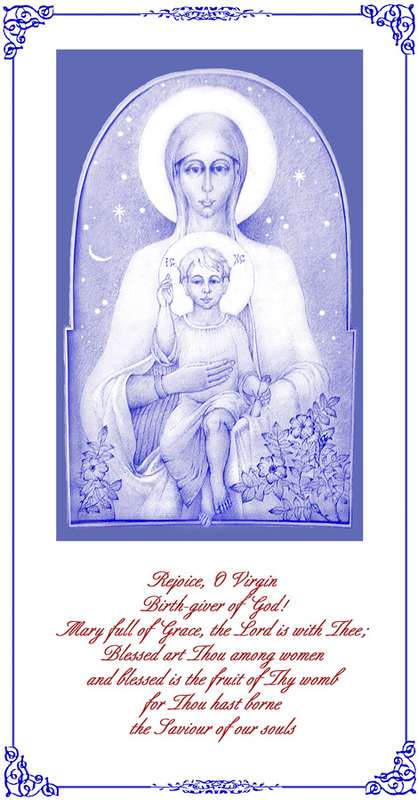 "Voskresenije Tvoje Kriste Spase", "Kristos Voskrese", bird singing, bell ringing and "Angel vopijasje"
The Angel cried unto Her Who is full of grace: Rejoice, O Pure Virgin! And again I say: Rejoice! Thy Son is risen from His three days' sojourn in the grave, and hath raised up the dead: Rejoice, O ye people! Shine, shine, O New Jerusalem! for the glory of the Lord is risen upon thee; exult now and rejoice O Zion; and Thou O Pure Birth-giver of God, be Thou adorned, in the Resurrection of Him Whom Thou didst bear! Then He conducted them out as far as Bethany and, raising His hands, He blessed them. While He blessed them He was parted from them and taken up into heaven. They worshipped Him and went back to Jerusalem with great joy. And they were constantly in the temple, praising God." whom the world cannot receive, because it neither perceives nor understands Him. You know Him, for He remains with you and will be within you. I shall not leave you as orphans; I shall come to you. In a little while the world no longer see Me; but you will see Me, for I live, and you, too, will live. In that day you will know that I am in My Father, and you in Me and I in you. and he who loves Me will be loved by My Father. I, too, shall love him and show Myself to him. "I am a beam of the light of truth"
he is constantly communicating with God alone. light, unspeakable gleaming, he has become." Let the light of truth shine into all mankind, and preserve the purity of our souls through the Holy Spirit. and the door to Paradise. Call me, O Saviour, and save me." “Seek you first the kingdom of God and His righteousness...” St. Matthew 6:33 by letting the searching and listening permeate your everyday life, since “...the kingdom of God is within you” St. Luke 17:21, and one cannot imagine a kingdom of God without the presence of God. So if the kingdom of God is within man there must be a God longing to express Himself through the man every day. This God, through Lord Christ, is the true nature and eternal identity of man. When this process is accomplished, and the Christian has annihilated his original sin of Adam, for the sake of Lord Christ, he is sanctified. Through the sanctified man this is how it can be done in a wonderful way “...in earth as it is in heaven...” St. Matthew 6:10. 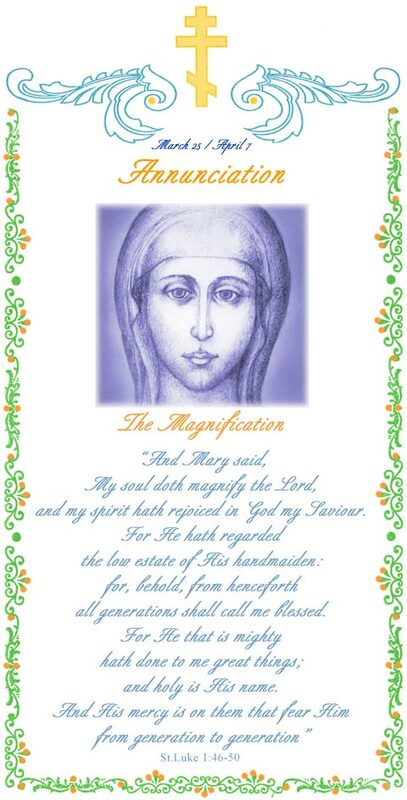 This is how Lord Christ can return to earth individually through each one who does not only believe in Him, but let Him be born (the secret of Advent and Christmas) and realized in his life. God has then become everything in the man, and the man has fulfilled the purpose of life - i.e. God's purpose with man. This way God's image - man himself - has carried out God's dream about the rehabilitation of Paradise on earth. Man was created in God's image, to be Him alike in every matter. He is born with the original sin of Adam, the first Adam’s disobedience to God, which Lord Jesus Christ removed when He let Himself be born into this world, through His teaching, and by giving His life – for us to convert and become an expression of Him and His holiness. 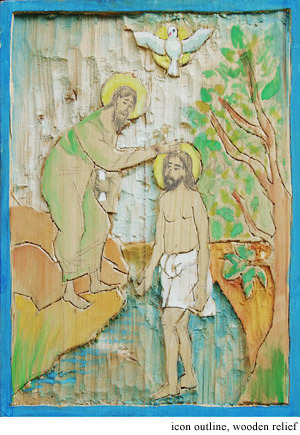 Everyone who is baptized is baptized to identify himself with and be like Him in every way, and in this manner let oneself be sanctified. When this purification is complete the God is, present in His kingdom in the heart of man, totally uncovered and apparent to the world and man has become a radiant image of God, who is the Life, cause and purpose of the world and all beings. The church, times of fasting, asceticism and the Jesus Prayer, the prayer of the heart, are all tools to help us reach this gaol. *Father Damascene, Russian monk, from “The orthodox Word” no. 221, page 277. Se also “The Saints lives in Christ”, page 262. Holy Orders (Priesthood), only for married men or monks. Matrimony between woman and man. 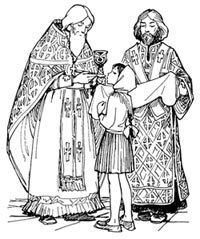 Unction with oil (Extreme Unction). 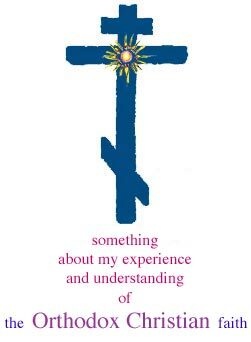 "Meditations on the Divine Liturgy"
This book is printed by Holy Trinity Monastery, Jordanville, New York. "You shall love the Lord your God with your whole heart, with your whole soul, and with your whole mind"
"You shall love your neighbour as yourself"
"Like shining stars You rose above our Northern dark sky. and to listen only for Him, and to serve Him with work and with hymns. 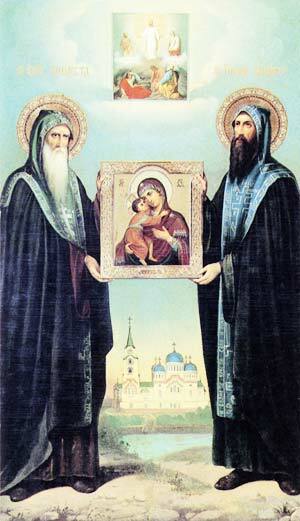 REJOICE, You blessed fathers Sergej and German"
The icon, which Father Serafim prayed, lived and reposed in front of. "We remain created beings but can still come to unity with God, like Christ in His taking shape as a human throughout the incarnation preserved His divine nature. The created and perishable world is filled with God's creating force, like an uncreated and eternal light; the everywhere present God." thou didst struggle in the wilderness with constant prayer and labour. 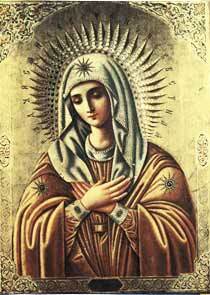 thou wast favoured by the Mother of God. "I shall not leave you as orphans; I shall come to you. In a little while the world no longer see Me; but you will see Me, for I live, and you, too, will live. In that day you will know that I am in My Father, and you in Me and I in you. He who has my orders and observes them loves Me, and he who loves Me will be loved by My Father. I, too, shall love him and show Myself to him." and even become an expression of. 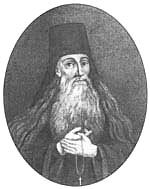 Florensky, who worked in the Russian religious environment where the hesychasm was common, names it of course as the light of Tabor. 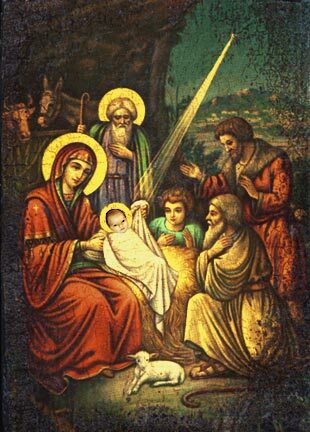 It is the light of the Trinity God, The light of Truth, lit in the world with the birth of Jesus. “With their radiant beauty the great ascetics, saints and starets reveal the “true church”, the mystery of the life of church. * Asceticism – methodical practising to overcome one’s lower self-centred nature to regain identity with God. ** (Teo) Sofia – (God’s) wisdom. Extract from a research work of Anna Smidhammar, who also has translated the book “Salt of the earth”, of Pavel Florensky, into Swedish. 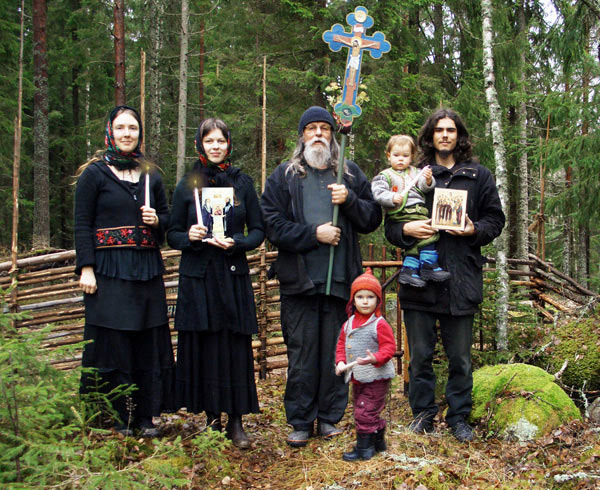 "The Orthodox Church tries to give its members a definite view of life. 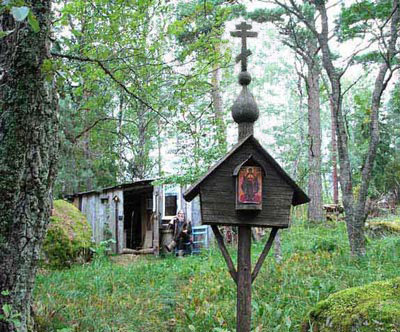 One can sometimes hear people say it’s passive and ignorant of the world; but that is a misunderstanding of the essence and doctrine (teaching) of the Orthodox Church. The Church doesn’t reject this world – it is in a living way engaged with it, and invite it’s members to take part in the subjects for rejoicing. The priests‘ home life, with their often large families, the large and well-tended estates of the Russian monasteries and convents, and the starets’* awake interest in the actual problems of the people looking for their guidance, the official services including all human life and work, and the blessing the Church gives to all kinds of food except for meat – all these things show how well the Church recognize the goodness of all created and gladly participate in all gifts of life upon earth." * Starets – Spiritually experienced and conscious guide in spiritual matters. 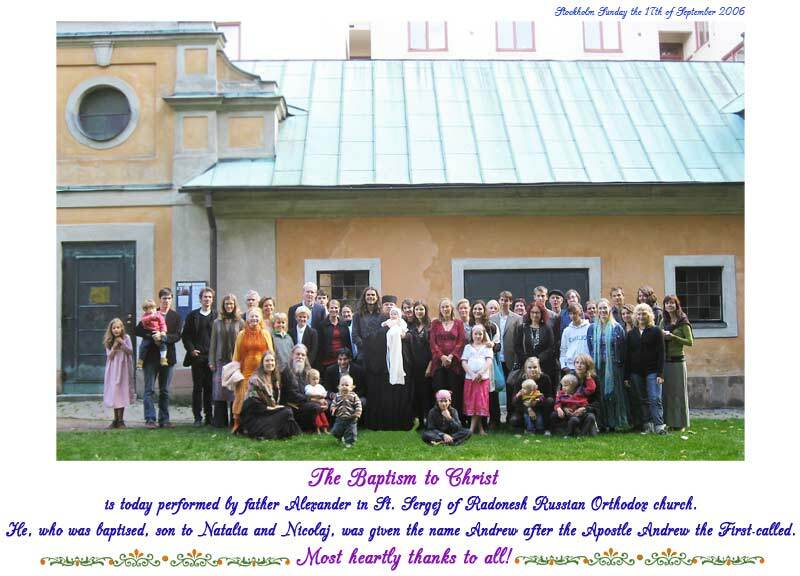 I have participated in meals in congregations and in monasteries where priests or managers have requested blessings in the name of Lord Jesus Christ over food consisting parts of animals of all sorts. When we today are very well informed about the condition in slaughter-houses, chicken factories and pig farms etc. etc. etc. how can one even think that a merciful and loving Creator and Father of all beings would bless this infernal treatment man gives these innocent and suffering animals for no other reason than keeping up mans lower and sinful character. Man's richest, and from God Himself given, nourishment is to find among vegetables in the wonderful nature, where crops does not just contain everything man needs for his physical life, but is also called "food for health". One could not imagine slaughter-houses, terrible roaring with agony of death, or the smell of blood in God's Paradise! This kingdom of God that we are invited to seek and manifest first of all, to make it come true we pray "...Thy will be done, on earth as it is in heaven..." St. Matthew 6:10. How will this ever happen on earth if we don't let God's will be realized in our lives? The interest for vegetarian food increases today rapidly among young people defending the rights of animals and man to a worthy life, while many Christians still live as meat-eaters of no other reason than their habit. There should be two different tables for the social gathering in churches and monasteries, one for vegetarian food, that are to be blessed*, and another table for other food. The congregations and churches, monasteries and convents should exemplary emphasize reverence for the holiness of all beings and the whole creation and set good examples in compassion, mercy, and righteousness in their following and loving of Lord Jesus Christ. * "...the blessing the Church gives to all kinds of food except for meat..."
"Let us with hymns (and by a righteous and worthy life) praise the Mother of God and the Mother of Light." 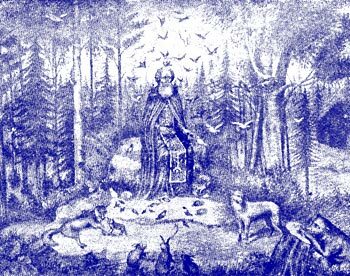 "Behold the life of innocent Adam in Eden"
Holy Pavel of Obnora in peaceful company with the wild animals in the forest. 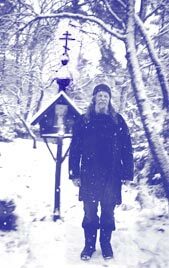 "Isac the Syrier says, that the human heart must burn with such compassion for the whole creation, that it is ready to break at the sight of suffering of the smallest animal. When the hearts of all human beings are like that God’s creation will be restored.Wild animals approaching holy hermits, licking their hands and showing them their confidence indicates this saying. Isac explains these situations with a fragrance sent forth from such a man, the same divine fragrance as Adam in Paradise sent forth before the Fall of man." 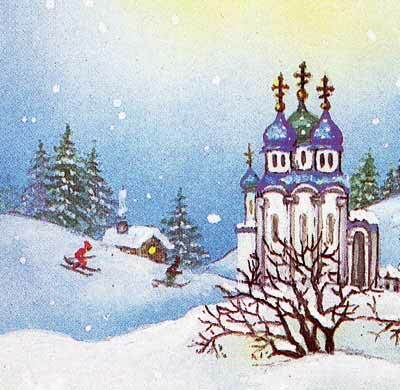 O Paisij, the joy of Russia, the boast of Athos and the wonder of Moldavia, by thy divinely inspired teaching, thou dost direct us to the found of wisdom and salvation. And now enjoying in heaven the vision of Christ God, entreat Him to grant us His great mercy, and save our souls. 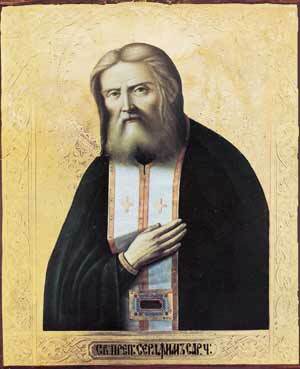 'It seems to me that, in accordance with the correct understanding and ordinance of the Holy Orthodox Church, one should not obey even an Angel in this matter. After the Flood the Lord, because of human weakness, permitted the eating of meat, but the order of monastic life corresponds to the life in Paradise, where there was no eating of meat. 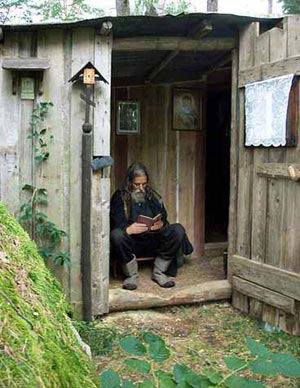 And although at the beginning of monastic life there was in places a falling away from this order, especially in large cities, nevertheless St. Sabbas the Sanctified confirmed the non-eating of meat; and such become the general order in all lands. Therefore, one cannot say that the non-eating of meat is only a local custom; and this cannot be left to the free choice of everyone, and it is not true that abstaining from meat harms the health. One should not be put under constraint by those who eat meat, but one must please God rather than men; and those who tempt you, when they see your firmness, will themselves praise you.' 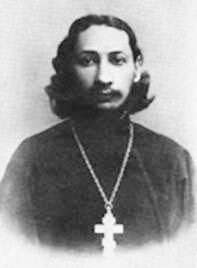 The Elder referred his disciples to the work of the Elder Basil of Merlopolyany on the monastic tradition of not eating meat,* and reminded them that the brethren of the monastery and the desert-dwellers would be scandalized and grieved if they knew that these brothers had begun to eat meat. 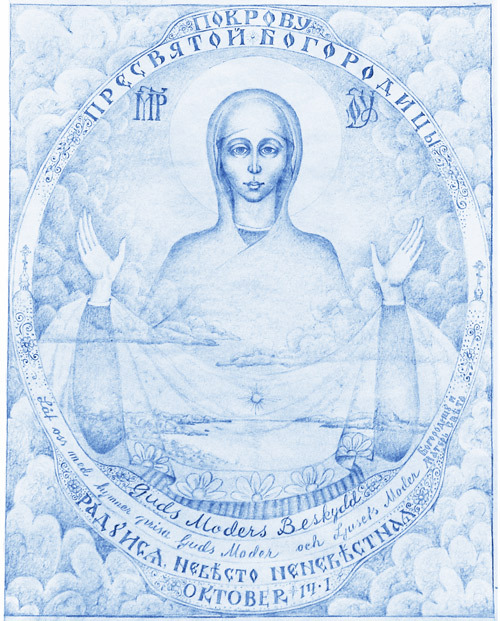 **"
"* Slavonic text of this work in the Optina Life of Blessed Paisij, pp. 134-157. ** This paragraph is from Chetverikov, vol. II, pp. 45-46." Text from "Little Russian Philokalia, vol. IV: St Paisij Velitchkovsky", page 145. 1:27 "So God created man in His own image, in the image of God created He him; male and female created He them." 1:29 "And God said; 'Behold, I have given you every herb bearing seed, which is upon the face of all the earth, and every tree, in the which is the fruit of a tree yielding seed; to you it shall be for meat." "Animals and Man - A state of blessedness"
"Animals Sanctified: A Spiritual Journey." both by Joanne Stefanatos D.V.M. 1:27 "So God created man in His own image, in the image of God created He him; male and female ceated He them." 19:2 "...Ye shall be holy: for I the Lord your God am holy." 20:7 "Sanctify yourselves therefore, and be ye holy: for I am the Lord which sanctify you." 20:26 "And ye shall be holy unto me: for I the Lord am holy, and have severed you from other people, that ye should be mine." 4:24 "And that ye put on the new man, which after God is created in righteousness and true holiness." 5:48 "Be ye therefore perfect, even as your Father which is in heaven is perfect." 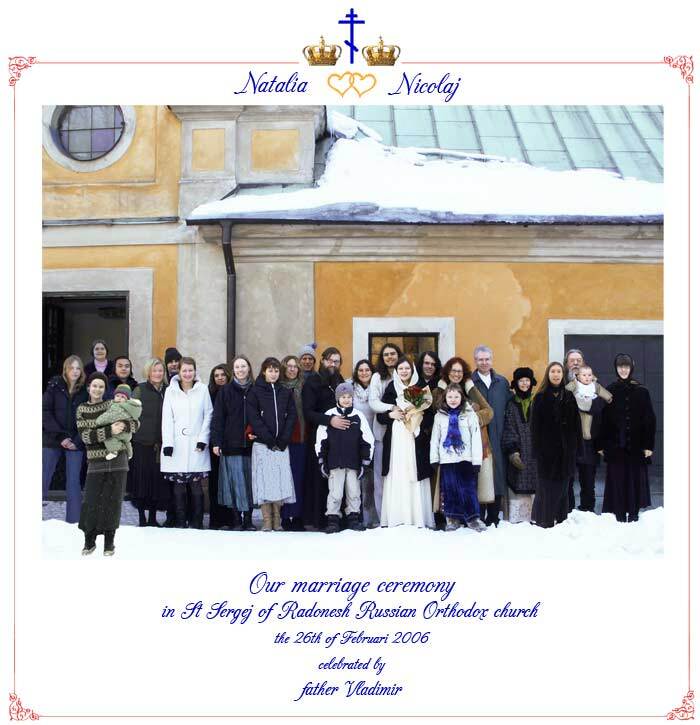 with the Swedish Lutheran church"
"MOSCOW (27th Dec. 2005 Interfax) The Moscow patriarchate has broken the relation with the Swedish Lutheran church, since it decided to adopt a ceremony for blessing homosexual couples. 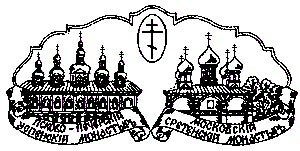 'We have with great disappointment and sadness received the news that the Swedish Lutheran church does not oppose so-called homosexual marriage, but has even decided to adopt an official blessing ceremony', said the holy synod of the Russian Orthodox church in a pronouncement at its conference in Moscow today. The members of the synod consider the decision of the Swedish Lutheran church to be contrary to the apprehension about family and marriage of the Bible 'and the testimony of the holy Scriptures leave us without doubts that homosexuality is comprehended as sinful and delusion', as it is said in the pronouncement. 'The Christian church has always considered the marriage between man and woman as a sacrament, while it is a union that gives rise to new life', as one can read in the declaration. The attempt to interrupt this tradition 'and present the distortion as a norm' is 'an open resistance to God’s will, offence to the order of the holy Scriptures and the old church’s traditions', as one can read in the declaration. The acceptance of homosexual marriages is a serious destruction of the system for European spiritual and moral values 'formed with influence by Christianity', says the declaration. 'This kind of modern ideas undermine the moral ground of the Europe civilisation and inflict irreparable harm on its spiritual influence with the world', is there to read in the declaration." Translation from a Swedish Orthodox magazine “Ortodox tidning”, no 2, 2006, p. 28. 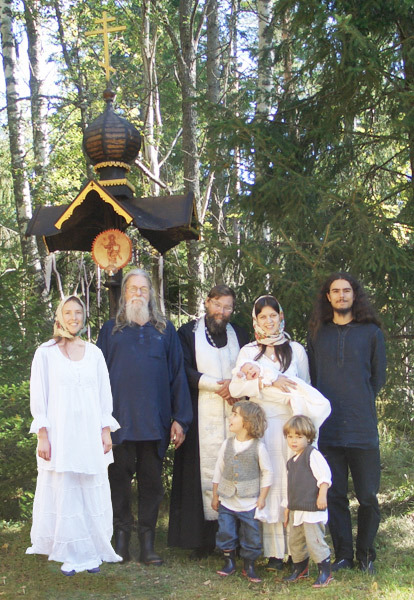 Picture from a Swedish Orthodox magazine "Ortodox tidning". come to an end in Christ. to be absorbed in the Light." let the light of Your face shine on us, so that we can see the unattainable light, and lead our steps so that we can fulfil your statues, through Your most pure and blessed Mother and through all the saint's prayers." "In Your light, we see light"
where we did return frequently from the "the world"
see picture at the bottom of the site. and the darkness has not overcome it..."
We give thanks to God for everything! till they see the Son of man coming in His kingdom." of God is within you." will not enter it at all." 1. 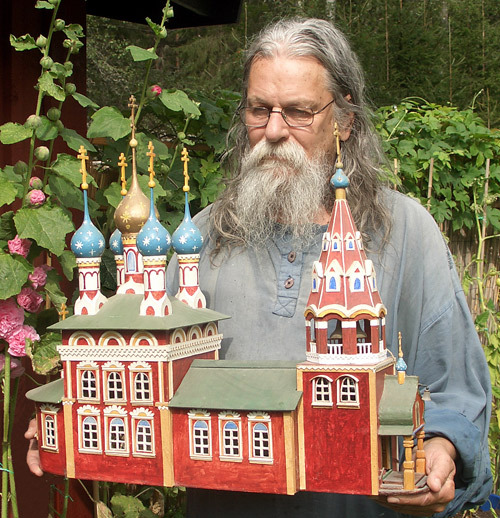 Church model for the heremitage. 2. The place for the church, picture montage. 3. Simon and Nikolaj is cutting down wood for the church building. 4, 5, 7. Cottage is being built for govenie; stillness, meditation, inner prayer and reflection. 6. Hilding-Emanuel is helping with hammer and nail. 8. Anna is working in the garden. 9. Nikolaj, Natalia and Andreas on recreation trip in the canoe. 10. 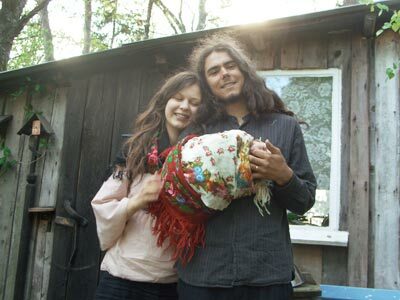 Nikolaj is getting down some flowers for tea (quite high above the ground). 11. 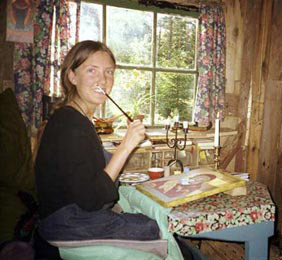 Natalia in the eremitage. Where the cross is placed, the church will hopefully be built. 12. A new member of the family, Signe-Elina, born on July 12th 2009. 13. 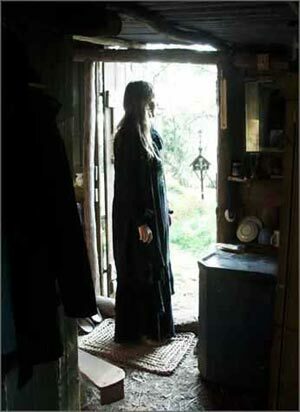 November 2009, the cottage for govenie is prepared for silence, meditation and inner prayer. 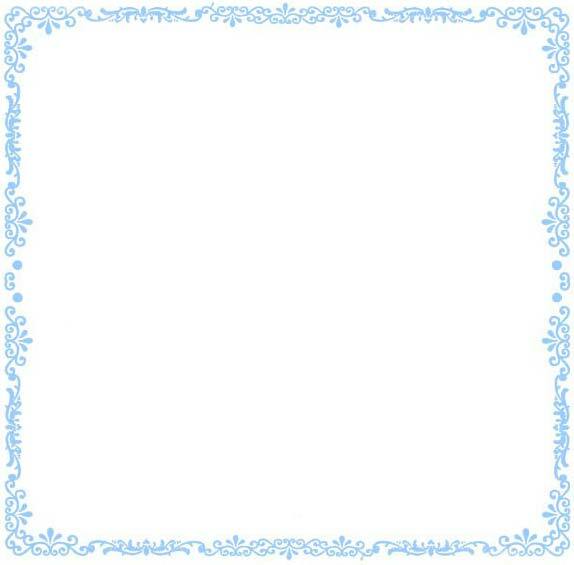 and the consecration, click here. To see a film from the consecration, click on part 1 and part 2.
no matter how despairing the silence can be."